This series of workshops takes a close look at how instrument builders have used science to make musical tools and how performers can use this information to make music. 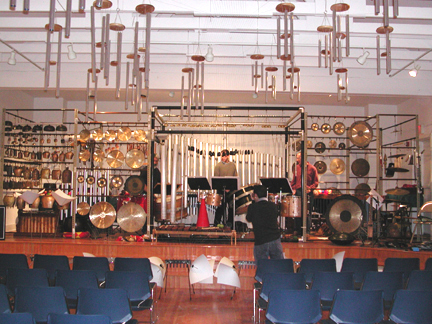 The work of Harry Partch, Francois and Bernard Baschet, Thomas Rossing, and Garry Kvistad will be featured along with intercultural examples such as American and Indonesian Gamelans, Trinidad and Tobago’s Steel Pans, J. S. Bach and experimental instruments. Instrument and mallet choice as well as playing technique ultimately affect the performance. Understanding the acoustic properties of percussion instruments will help the performer make better musical choices. The music of Takemitsu, Telemann, Reich, Bach, and Bertoncini will demonstrate acoustical phenomenon with practical lessons. Technical requirements: Projector, screen and sound system. Projector will be attached to a Dell Inspiron 8200 Laptop. Handout masters will be supplied to be copied by the presenter for the clinic.